The Lisbon lemon is the winner of the "popularity" contest in the lemon world! Graced by their ample year-round crop, Lisbons are good producers in hot inland regions. 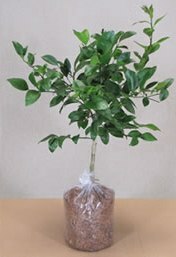 The Lisbon is considered to be somewhat more resistant to cold weather conditions than Eureka lemon trees once well established. Indeed they are one of the most widely-grown lemons in California and is planted extensively throughout the citrus-growing regions of the world! Yup, they are THAT popular. The fruits are quite similar to Eureka lemons, with similar taste and juice content.